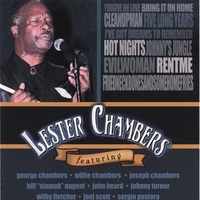 "From the perspective of sheer impact Lester Chambers' self titled Explosive Records' debut CD is about as good as it gets. Not content to simply rehash his glorious 60's past, Chambers has crafted a remarkably diverse effort that embraces his roots as well as offer some surprises. Two Chambers' originals, "You Give Me Love" and "Evil Woman" stand out brilliantly amid a colorful field of soulful contenders, making this record not so much a comeback as a reminder that good music never goes out of fashion." "One listen to LESTER CHAMBERS the latest release from Explosive Records tells you that its creator is a man who has been around the musical block. The whole disc shimmers with an aura of experince and savvy, from the knowing reggae reworking of Sam Cooke's "Bring It On Home" to the original "You Give Me Love" a bluesy evocation of the world's great soul singers." Lester is sounding wonderful on all these cuts. Reminiscent of the best of old school blues, r&b, funk, yet fresh in approach. Everyone should buy this CD. Why? Listen to the wonderful arangements, horns and soul that each musician added to this wonderful feat! Go ahead and by this music now, You won't be sorry !